Pre.S. There's a Part II to this entry, which includes observations and questions regarding consolidation plans. Well, it seems nothing can stop USPS management now: the list of 223 processing plant consolidations is out. That said, and with the presumption that this process will be extremely difficult to stop, I present to you photographs of some of the plants that are slated to close. I started photographing P&DC/Fs about a year ago. I've been to perhaps 20 all in all, but will be presenting just a few here. More can follow. Note: Anyone who would like to submit photos of their own plant [exterior] is more than welcome to; I'm happy to make more posts or put together a full gallery in the future. If you have any memorable stories or funny anecdotes about your processing plant, also feel free to pass that along. I'll archive it. Also: Definitions might be in order, since I've noticed some folks found my site by searching for the meaning to some terminology. Originating mail is that which has been deposited by the mailer and which is entering the mailstream. It generally needs to be cancelled, coded, and routed to other processing centers for delivery. This is the P: Processing in P&DC. Destinating mail (the D: Distribution in P&DC) is that which is has been processed, brought to its final sorting site, and which is getting ready to be delivered. > Originating and destinating mail to be consolidated into the Hartford, CT P&DC. USPS has owned 24 Research Parkway in Wallingford off I-91, a town halfway between New Haven and Hartford, since 1995. The P&DC measures about 400 feet by 800 feet and handles mail for the 063 and 064 ZIP code prefixes. Mail postmarked here receives "SOUTHERN CT 064" spray cancels. I've been unable to validate whether it maintains a hand-cancel / dating device with its name on it. To be consolidated into the Westchester, NY P&DC (both originating and destinating mail). Driving home from Rhode Island one summer Saturday I followed a convoy of mail trucks taking exit 6 on I-95 and soon discovered the Stamford P&DC. I popped into the parking lot at 7, asked if anyone knew about any potential hand-cancels inside, and a sorter volunteered to help me get my cards postmarked with a Stamford P&DC round dater while I waited outside. How nice is that? I hope his commute doesn't get too difficult with the move to Westchester. 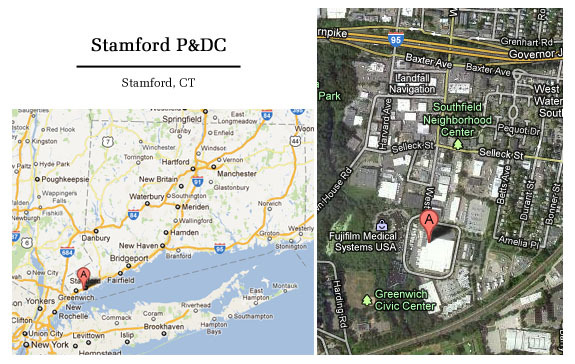 The Stamford P&DC is located on an industrial/commercial strip southwest of downtown Stamford and has easy access to I-95. It measures about 350 by 400 feet, and USPS has owned the site since 1988. This facility handles the mail for southwestern Connecticut post offices. > To be consolidated into the Johnstown, PA P&DF (both originating and destinating mail). A relatively recent plant, USPS has been at this site since 1998. 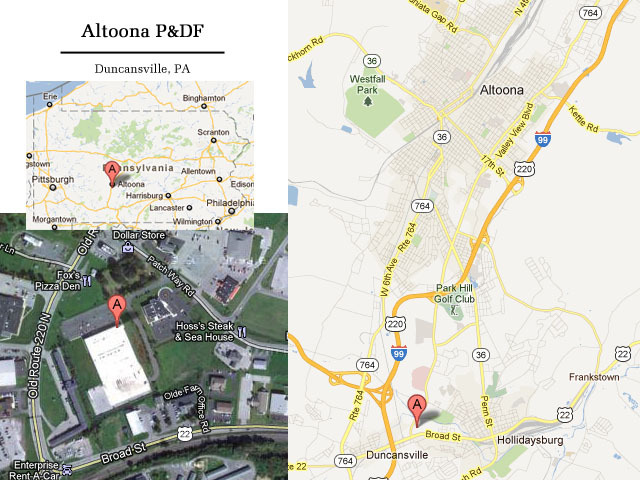 The facility sits back off a nondescript road near I-99 south of Altoona. The area otherwise resembles sprawl. It doesn't look too big from the front, though satellite imagery shows that the building measures about 250 by 500 feet. Easton, MD P&DF: Two proposals were withdrawn: the consolidation of the Easton P&DF into Baltimore and the Wilmington, DE P&DC into Philadelphia. Instead, the current plan being studied is to consolidate Easton, MD mail into Wilmington. Frederick, MD P&DF: Save the Post Office reports that issues abound with regard to the Frederick plant's consolidation into Baltimore. I witnessed hints of this in western Maryland right after the final transition occurred: at one PO a woman berated the clerk for her Monday's mail arriving Tuesday morning. The clerk was apologetic and noted that mail trucks which used to arrive at 7:30 from Frederick were, at least then, arriving at 11:00 from Baltimore. Long Island Processing Plants: The Queens P&DC is being consolidated into Brooklyn. Meanwhile, "Triboro NY 112" cancels might be a thing of the past as originating mail from the Brooklyn P&DC is to be consolidated into New York's Morgan P&DC. This implies that Brooklyn would be a destinating mail-only plant, also handling that for Staten Island. The Western Nassau Mail Processing Facility will remain open, as will the New York L&DC in Bethpage. Hey Evan, love your blog and was hoping you could explain something to me. Since the Erie process center is closing, if I mailed a letter from Meadville, Pa to Meadville, would it go to Pittsburgh to be processed then back to Meadville for delivery? Thanks. Yes, although according to the USPS list (linked to in the entry above), Erie operations are to be consolidated into either or both Pittsburgh or Rochester. I note that presently, mail sent from Meadville to another location nearby would be expected to arrive overnight after processing in Erie. This would no longer be the case after consolidation. Thanks for the explanation. I suppose we can also assume that the Pittsburgh or Rochester facility will not be increasing their staffing. So, they will have x amount of more mail to process, which will cause further delay in addition to the time it takes for mail to travel from Meadville to there and back to Meadville. The argument cited is that, regardless of transportation costs, economies of scale can be utilized if processing is regionally centralized and machines in larger processing facilities are used for 20 hours a day, instead of for just a few at present locations. Staffing is an interesting question. There are several postal news aggregation sites that have a lot of information regarding labor issues: PostalNews, PostalMag, etc. APWU says have no fear...next week we'll have another version of the contract that will cover this issue!